Here’s where we are supposed to shine. Many people believe that the true strength of our health care system lies in our ability to treat life-threatening illness. In effect, they believe that our health care system succeeds by preventing death from major diseases. Those are measurable data. I’m going to be presenting you with a lot of charts today, because I want to cast a pretty wide net. All of these will be considering mortality rates, or how many people die each year from certain diseases. Before you start to talk about survival rates, go read this. It explains why I’m not going to use that misleading statistic. Well, the good news is that we are among the best in the world when it comes to breast cancer mortality. We’re not the best, but we’ve been #2 in the G8 for a while. Japan however, seems to be doing much, much better than we are. Granted, cervical cancer is nowhere near as prevalent as breast cancer, so far fewer women die of it every year. But compared to comparable countries, I think it’s safe to say that we are middle of the pack in treating it. 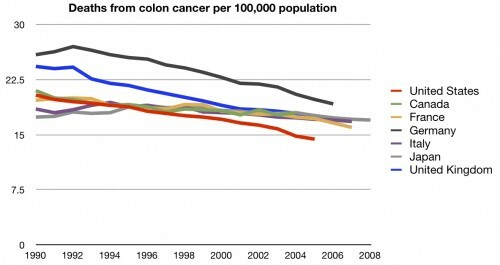 We are very good in treating colon cancer, with the lowest mortality rates when compared to comparable countries. A solid win for he US. The deadliest cancer, in terms of killing the largest number of people, is lung cancer. How do we stack up there? Shockingly bad. We’re dead last. And before you start blaming high smoking rates, remember that the US has some of the lowest rates of tobacco use of these countries. Could be worse. We’re certainly not the worst, but nor are we the best. So, some good news and some bad news. How does this all combine in terms of our treatment of cancer overall? Not nearly where you’d like to see us. Because we don’t do as well with some of the more prevalent cancers, we wind up doing much worse overall when it comes to cancer mortality than you’d think. This is why, when some point to us having the “best” health care system, they focus on colon cancer or breast cancer, not on lung cancer. Overall, though, we’re not. But that’s cancer. How do we do in treating respiratory diseases? Not so good. We beat the UK, but no one else. Less common than cancer, but still, a fair number of people die from these illnesses. How about deaths from heart attacks? Solid middle of the road again. I don’t want you to think I’m cherry picking diseases, though. Here’s how we stack up in mortality from all causes. Last place. Not where you’d expect to find the “best” health care system. Now I know a few of you are going to look at the list of “causes” I link to and take exception with some of them. I agree that deaths from assaults, suicides, falls, etc. can’t be blamed entirely on the health care system. But the number of deaths from the causes you are likely to complain about are small in relation to the total number of deaths. 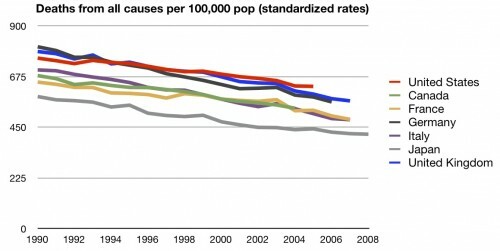 Moreover, were not the worst in death rates in all those “questionable” categories. So that’s not the answer. Plus, this is where we are supposed to shine. Preventing death is traditionally where we should feel safe in our skill. Unfortunately, we do well in some subsets, while middling or terrible in others. Overall, we’re in the bottom half when it comes to this category. UPDATE: I made a mistake on the charts and fixed them. It’s my goal to be accurate, not to make the US look good or bad. Hmmmm… what’s up with respiratory disease in the UK during the Clinton administration? I guess I’d quibble with your conclusion that you rate us as ‘bad’ on this metric, since by some measures we do well, by others we do poorly and by still others we’re in the middle of the pack. But it’s your blog. Anyhow, once you filter outcomes through the fact that we use the most sophisticated technology and spend by far the most leads one to a depressing but not terribly surprising conclusion. @Ken Hamer, It may have something to do with transitions from ICD-9 to ICD-10 in 2001 in the UK. Changes like this are one of the reasons I show you long stretches of time and don’t cherry pick a year. They are still the worst in other years. @RZ – I’m not sure where exactly you mean, but it may have been before I fixed things. re: lung cancer (and maybe all things where we lag, really…) I wonder how many of the areas where we lag are as a result of disparities. 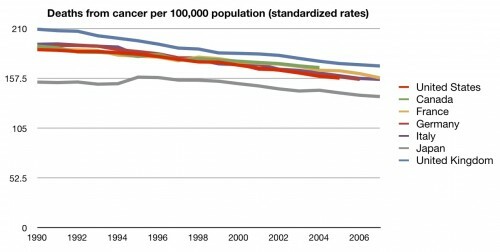 Off the top of my head I know that lung cancer disproportionately affects certain demographics more than others. I wonder if, say, African American’s disproportionately higher incidence of lung cancer was corrected where we’d end up in your G8 chart. Not that fixing disparities is vastly easier than fixing outcomes; but it is a tiny bit easier as you can focus on insurance reform, access, education, what have you. Interesting charts. What’s up with Japan though? They’ve got the lowest # of deaths per 100,000 when it comes to Breast/Lung/Prostate cancer but overall they’re dead last when it comes to deaths by cancer overall. They fall behind in some of the categories, but they’ve got such a huge lead on some cancer types that I’d figure they’d be at least somewhere in the middle of the pack. You make this many charts, and some errors occur. 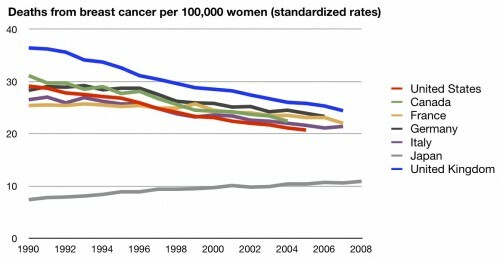 The colors got messed up in the all cancer graph. I fixed it. You can see that Japan does best in the scorecard, so I got that right. Thanks! The “Deaths from all causes” graph is extremely misleading because it doesn’t adjust for age of the population. I’m sure, for example, that the Ft. Meyers area has a much higher “Deaths from all causes” number than, say, State College, PA. That doesn’t mean that Ft. Meyers has worse health care; it just means that they have people who are a lot closer to death. After all, over a long enough time period, those “Deaths from all causes” will approach 100%. The real question is how old do people in each country live, *not* how many of them die in any given year. @Ken- I assumed it was heavy breathing over the Lewinsky affair. @Chris-Aaron has already addressed this by looking at longevity. We dont do very well there either. so by both measures, we are a bit behind or in the middle of the pack. @Aaron- Why mortality over 5 year survivals? To be clear, I mostly agree with your choice of metric, but it is the one probably most cited and a major reason for some controversy on the whole issue. If you intend to address this later, just ignore this question. Maybe minimizes lead time bias and emphasizes case mortality rates, more reflective of successful treatment over more aggressive and unnecessary screening–certainly a metric that would favor US. But then again, I am not Aaron. Dont eat fried funny bones or ring dings. PS–kudos on all your posts…always sharp. 1. Much of lung cancer is untreatable. 2. There are huge lags in smoking and onset. 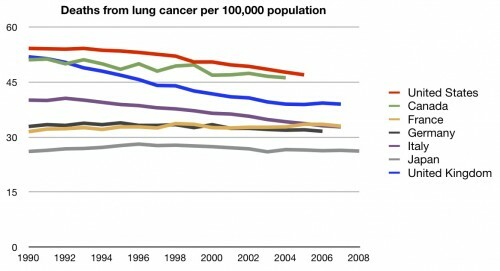 It seems to me very little of the rate of death due to lung cancer is due to treatment. The same might be true the other diseases (see Robin Hanson and The Rand health insurance experiment). The data is very muddles for example the USA does OK in most categories except lung cancer but ends up in last place overall. BTW People of Japanese descent live longer all over the world. I know how to win these silly international contest on health and education, that is let 100 million Chinese people immigrate. I just say this to show how silly this all is. Then we can brag about how great our health care and education systems are. One more thing seeing that so much medical care futile if our hospitals are more pleasant that is big. You are using Dd/Pc as a metric for disease care. Could a person use Dd/Ndc ? Or, more specifically, why not use Dd/Ndc? It seems more intuitive to me (but then again, I’m a moron). /reviews course notes from EPI 1. 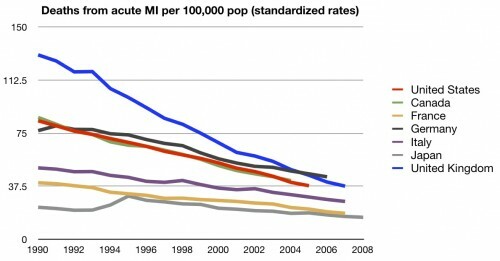 Why not use case-fatality rate as well as mortality rate? Neither one is a perfect metric for disease care, but both shed some light on the issue. How does the age mix of a country affect this results? For example, countries who have an older population, less immigration might have reared adults who are less prone to disease or more resistant… Who knows… Because is very interesting that immigrant countries stick together (Canada, USA) despite huge health care system differences. What am I missing on the combined cancer chart? You state the US is near the worst, but at the point where the US time series ends we look to be second best behind Japan. I’m curious about the incidence rates for these diseases between different countries. For instance, does Japan have such lower mortality rates from prostate cancer because they they have a smaller incidence of the disease in the first place? Additionally in the previous post you showed that Japan has way more CT and MRI scanners than anyone else, and they have much better mortality rates for cancer than anyone else. I think its reasonable to say that cancer treatments are most effective when the disease is discovered early (ie: surgery prior to metastasis). Could they be directing their efforts more towards early detection with all their extra scanners, and identifying cancers when they can be easily treated? I live in Japan. Much, much more effort is put into cancer screening (yes, using all those fancy scanners) and early detection than in the US. In my case, a pre-cancerous stomach condition was detected using an X-ray machine that resembled something out of the space program, and it was treated early enough that my likelihood of actually developing stomach cancer is relatively low. In the US it probably wouldn’t have been found until too late. Diet also probably plays a significant role in lower rates of breast and prostate cancer. I would guess the respiratory illnesses are mostly smoking-related as well, which is still a problem area for Japan. Early detection is important for some things, but some more than others. Also, focusing only on Japan is cherry picking. We are beaten by many countries, most of which have less technology than we do. It’s not the silver bullet. Also, Japan may have more scanners, but I’m not sure they use them more. Their system is cheap. As for incidence rates, I’d point you to this post. We have more of some diseases and less of others. I cherry picked Japan because it was such a curious outlier. They perform MUCH better than anyone else in cancer mortality rates, so either they have a silver bullet, or they have lower incidence rates. It could be that we perform so poorly in this metric, not because we have worse treatments (I’d imagine they’d be in line with other G8 nations), but because we have proportionally more people with the diseases in the first place. Without providing much specifics (just the outliers) the “blame du jour” graph seems to support this, with more data points on the “sicker” side of the graph than the “healthier” side. Don’t get me wrong, I fully agree with overall argument that we’re not getting what we pay for. I just thought (like skyjo did) that this metric would be more useful as a case-fatality rate or by providing the incidence rates to go with the mortality rates. 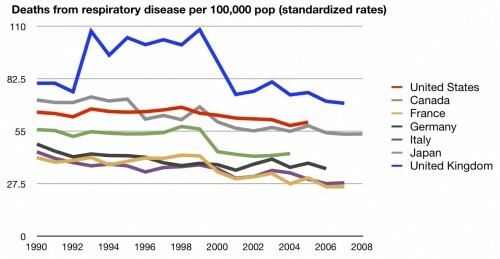 What I find fascinating is that the UK disease care is so poor, but our life expectancy is higher than the US. This is not a remote possibility in the United States, which had the highest level of cigarette consumption per capita in the developed world over a 50-year period ending in the mid-80’s (Forey et al. 2002). Smoking in early life has left an imprint on mortality patterns that remains visible as cohorts age (Preston and Wang 2006; Haldorsen and Grimsrud 1999). One recent study estimated that, if deaths attributable to smoking were eliminated, the ranking of US men in life expectancy at age 50 among 20 OECD 2 countries would improve from 14th to 9th, while US women would move from 18th to 7th Preston, Glei, and Wilmoth 2009).